The Career Planning and Development Center hosts employers on campus to connect students with opportunities. 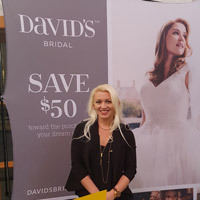 The Career Planning & Development Center welcomed representatives from David’s Bridal to host an information table in the University Center promoting part-time and seasonal openings, as well managerial positions on Wednesday, Nov. 9. The event was part of Career Planning & Development Center's on-going series hosting employers on campus to connect Webster students with employment and career opportunities. Opportunities available at David’s Bridal range from seasonal customer service representative to operations manager positions at individual stores as well as management and corporate settings. The global, omni-channel brand is supported by state-of-the-art technology and is the largest bridal retailer in the world. Several Webster students are already employed by David’s Bridal. For more information about local opportunities, contact Erica Hoeing Robinson and Brandy Bregg, managers at The Plaza at Sunset Hills location, 314-909-8828, Cbenderschroeder@dbi.com, or log in to Gorlok Career Link. Students can visit Webster's Career Planning & Development Center and access more opportunities through the Gorlok Career Link.